❶A woman who miscarries can donate the baby's body for research. Hair Care Stem Cell. Not all embryonic stem cell research is unethical. A woman who miscarries can donate the baby's body for research. May I point out to you that of all the research that has been done with stem cells that embryonic is the only one that has not yielded any progress. There have been incidences in different parts of the world where people are able to walk again after spinal cord injuries. This may be an interesting article for you: Most of what you hear on the news and other open sources is frivolous information trying to confuse the public as to what stem cell research really is. That I believe is why the proposition passed in Missouri to legalize certain stem cell research. The proposition was written to confuse the public and make it sound like a charitable thing. Unless you were very well versed in what the research was, you'd have no clue as to what the proposition was actually saying. Check out that article, though, hopefully this nation can become more prolife some day so that we can focus our research on something more worth while. Stem cell research is legal, has always been legal, and will remain legal. All Bush did was limit government funding to stem cell lines that were in existence at the time that bill was written. Which is fine by me. Actually, I'd prefer no funding. Why should my tax dollars go to a private entity to do research? I say NO to corporate welfare. It was never illegal. I wish people would either learn what they are talking about or be more clear. Adult stem cells are legal for research. You can find them in fat cells among other things. I think that people are confusing killing an unborn baby with stem cell research. No one is encouraging abortion so that we can start using all the fetuses. They are using embryos that were left over from invitro and going to be destroyed anyway. Its a socialist idea.. Control the few for the benefit of many. Fetal stem cells, no. They are unstable and no cures have ever been found. Adult stem cells, yes. They are stable and are showing promising results. Forcing conception just for the sake of it i have a problem with. I guess you can tell that i feel life begins at conception. Yes, it's never been an issue. By implementing these guidelines, the federal government would encourage researchers to conduct destructive embryo experiments that are punishable as felonies in some states. This proposal is immoral because it violates a central tenet of all civilized codes on human experimentation beginning with the Nuremberg Code: It approves doing deadly harm to a member of the human species solely for the sake of potential benefit to others. The embryos to be destroyed by researchers in this campaign are at the same stage of development as embryos in the womb who have been protected as human subjects in federally funded research since Treating human life as mere research material is no way to show respect. 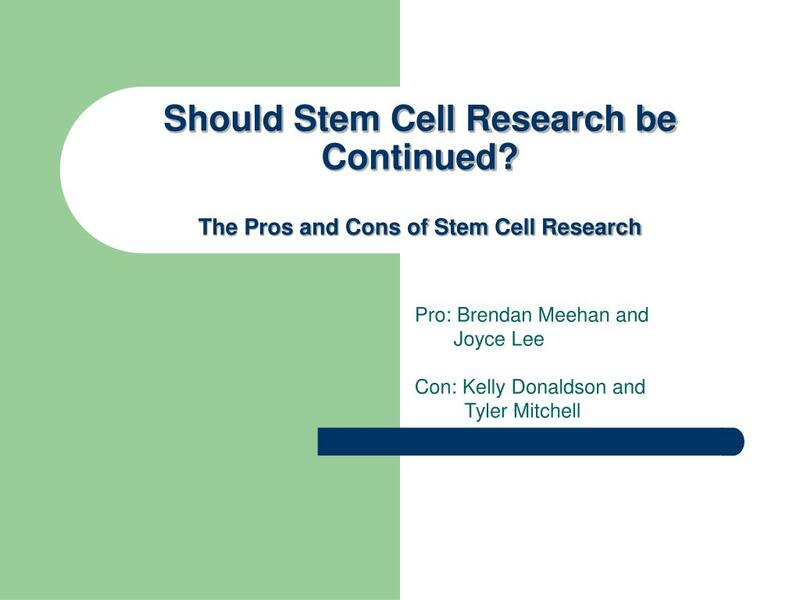 Finally, this proposal is unnecessary because adult stem cells and other alternatives are already achieving some of the goals for which embryonic stem cells have been proposed, and new clinical uses are constantly being discovered. In our view, human life deserves full respect and protection at every stage and in every condition. The intrinsic wrong of destroying innocent human life cannot be "outweighed" by any material advantage -- in other words, the end does not justify an immoral means. Acceptance of a purely utilitarian argument for mistreating human life would endanger anyone and everyone who may be very young, very old, very disabled, or otherwise very marginalized in our society. However, even the Clinton Administration's bioethics advisors, who denied human embryos the moral status of "person," concluded that they could only be destroyed for research as a last resort, if no alternative course existed. It cannot be denied that these alternatives are available. To be sure, further study will be needed to determine their full potential. But to fund destructive embryo research now, alongside these morally acceptable alternatives, would be to deny any moral status at all to human embryonic life. For that is what we would do if there were no moral issue at stake. Funding embryonic stem cell research here and now will force all taxpayers to act as though they agree with the international chairman of the Juvenile Diabetes Foundation that human embryos have no more value or dignity than a goldfish. This view of the human embryo as a goldfish has apparently garnered support from some members of Congress who have generally opposed abortion. Their claim is that human life does not begin until placed in a mother's womb. Biologically, however, this is an absurd claim. An embryo's development is directed completely from within -- the womb simply provides a nurturing environment. Scientists tell us it would be technically possible to nurture a human embryo in a man's body by abdominal pregnancy, or in a mammal of another species, or even someday in an artificial womb. A subtly different argument has also emerged to try to justify using embryos from fertility clinics for destructive experiments. While human embryos ordinarily deserve respect, goes this argument, these particular embryos do not, because they "would be discarded anyway" by their parents. But this is, to say the least, fallacious reasoning. If parents were neglecting or abusing their child at a later stage, this would provide no justification whatever for the government to move in and help destroy the child for research material. We do not kill terminally ill patients for their organs, although they will die soon anyway, or even harvest vital organs from death row prisoners, although they will be put to death soon anyway. If people's value depends entirely on the extent to which other people "want" them, they have no inherent value at all. So on reflection, this argument ultimately reduces to the argument of "embryo as goldfish. The argument also rests on a false premise. The embryos slated for destructive research under the NIH guidelines are those deemed to be "in excess of clinical need" by fertility clinics. This simply means that they are not needed or wanted by their parents for reproduction at present. Parents in this situation are routinely offered several options, including: The NIH guidelines require that these parents be asked to consider donating their embryos for destructive cell harvesting at the same time that they are offered these other options. That is why the adoptive couples of some of these former "frozen embryos" have filed suit against the guidelines. We have presented our position on this issue at length in other testimony. Since we testified before this subcommittee in , startling advances have been made in adult stem cell research and other non-embryonic avenues for repairing or replacing damaged organs and tissues. The field of "tissue engineering" using adult cells has exploded as researchers move toward rebuilding ears, tracheas, and even hearts. Finally, adult pancreatic islet cells from cadavers have been used to reverse juvenile diabetes in fifteen patients, and further human trials are being planned at several centers in the United States. At the annual meeting of the American Diabetes Association on June 24, researchers announced that all patients benefitted from the transplants, and nine have remained "insulin free" for a median period of eight months — with some patients requiring no injections for up to two years. Hailed by experts as a "remarkable advance," this breakthrough has also received enthusiastic attention from Lee Ducat, founder of the Juvenile Diabetes Foundation JDF. They say they never knew what feeling normal is all about. Yet this good news has gone largely unnoticed by the current leadership of the JDF. Instead the organization is focused on diverting funds toward a misleading ad campaign to persuade Americans to support killing human embryos for their stem cells. Neglect — even misstatement — of recent scientific data was also evident in last year's testimony before this subcommittee by the Christopher Reeve Paralysis Foundation. Reeve, on behalf of the Foundation, testified that adult stem cells are no substitute for embryonic cells because they cannot be "pluripotent" but are confined to a narrow range of specialization. Yet a few weeks after that hearing, researchers funded by the NIH and the Christopher Reeve Paralysis Foundation published a study indicating that adult bone marrow stem cells "may constitute an abundant and accessible cellular reservoir for the treatment of a variety of neurologic diseases. Their article, prepared under the aegis of Mr. Reeve's foundation, was received for publication in March , before Mr. Reeve testified in April that adult stem cells cannot be pluripotent. An author of that study, Dr.
Darwin Prockop, told this subcommittee last year that the implications of his work should not be overstated and that he himself supports funding both embryonic and adult stem cell research. However, medical and patient groups have now tilted the pendulum so far toward outright denial of the facts about the promise of adult stem cell research that Dr.
Prockop recently felt obliged to correct the record. Responding to an article that questioned the benefits of adult stem cells, he notes:. More than 20 years ago, Friedenstein and then others grew adult stem cells from bone marrow called mesenchymal stem cells or marrrow stronal cells MSCs. MSCs differentiate into bone, cartilage, fat, muscle, and early progenitors of neural cells. Human MSCs can be expanded up to a billionfold in culture in about 8 weeks. Preliminary but promising results have appeared in the use of MSCs in animal models for parkinsonism, spinal cord defects, bone diseases, and heart defects. Also, several clinical trials are in progress. In addition, there are promising results with other adult stem cells that perhaps we may yet learn how to grow effectively. Perhaps the most troubling and unwarranted fixation on embryonic stem cells to the exclusion of all other approaches has been exhibited by the Parkinson's Action Network PAN. While this bill places no restrictions on embryonic stem cell research — indeed, does not mention such research one way or the other — PAN believes that this much-needed additional funding for promising medical research must be rejected because it does not include stem cells obtained by destroying embryos. By this logic PAN would have to oppose all current NIH funding for Parkinson's research, which has never included funding for embryonic stem cell research. In the past two years, initial enthusiasm over embryonic stem cells has been dampened in the scientific community by some sober realizations, even as patient groups organize public campaigns based on earlier assumptions. First, these cells are not as easy to maintain in the laboratory as once thought. Researchers call them "tricky" and "more tedious to grow" than their mouse counterparts, as well as "really difficult" to direct toward more specialized cells. Second, a new study of problems in cloning suggests that embryonic stem cells are "surprisingly genetically unstable" in mice and perhaps in humans as well. This "may complicate efforts to turn the cells into cures," and interfere with efforts to produce all-purpose cell lines that could reliably become tissue of any desired type. John Gearhart of Johns Hopkins University now says. Establishing hundreds of these cell lines could require destroying many thousands of human embryos, and replenishing them with thousands more when the original cell lines become too unstable for further use. Perhaps most troubling is the news that these researchers deleted from their final paper a reference to this problem, believing that any public acknowledgment of such setbacks has become too "politically sensitive. We have reached a stage in this discussion where, on the side supporting destructive embryo research, science is becoming subservient to politics. Third, the chief advantage universally cited for embryonic stem cells -- their ability to grow and differentiate into all the more than kinds of cells and tissues in the human body -- is proving to be a major disadvantage for transplantation into living bodies. For it is very difficult to make these cells stop turning into all kinds of cells and tissues. In recent studies, embryonic stem cells or partially differentiated cells arising from them "stayed in a disorganized cluster, and brain cells near them began to die. 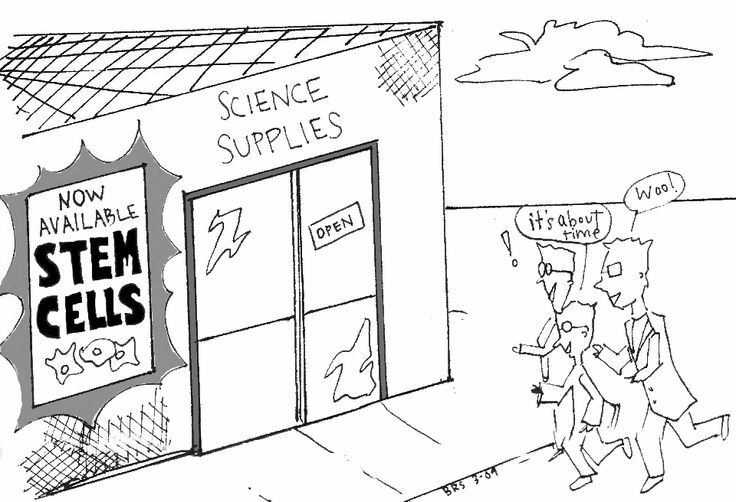 The emerging truth in the lab is that pluripotent stem cells are hard to rein in. The potential that they would explode into a cancerous mass after a stem cell transplant might turn out to be the Pandora's box of stem cell research. 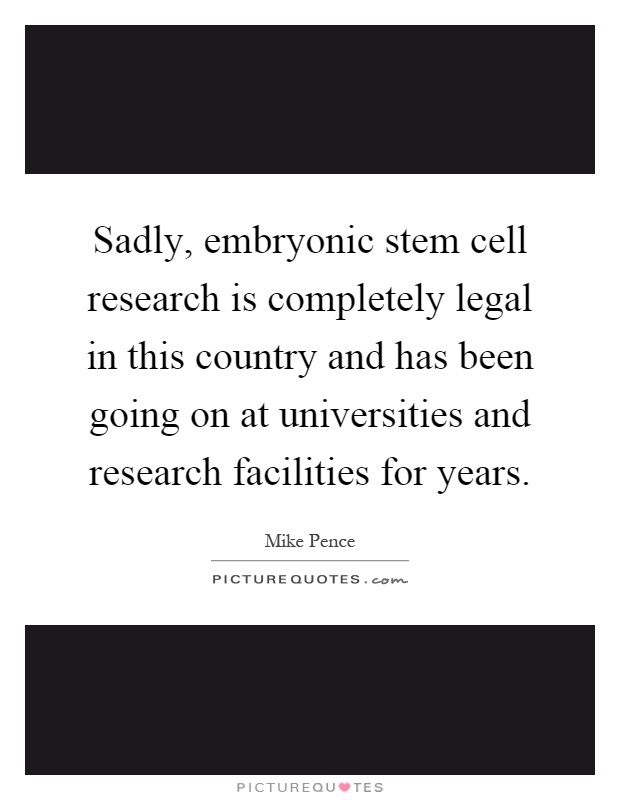 Yes, stem cell research should remain legal and become government-funded. Honestly, the entire argument against stem cell research is null and void. It rests upon the belief that it is immoral, as it involves the destruction of human embryos. Whether stem cell research should be conducted or not is a massive issue that can be approached from many fact-based perspectives, but the more controversial debate is over whether the stem cells used should be embryonic or adult stem cells. Specifically, the legislation should charge the National Institutes of Health and the Department of Health and Human Services with the duty to update at regular intervals its regulations for embryonic stem cell research in light of new science. Feb 03, · Stem cell research is legal, has always been legal, and will remain legal. All Bush did was limit government funding to stem cell lines that were in existence at the time that bill was ggettsy.cf: Resolved. Question:Should Embryonic Stem Cell Research Be Legal? Skin Care Stem Cell. Adonia StemuTone Body Firming Plant StemCell Treatment 6 oz. 0. Share $ Buy Now. Gentle, non-drying cleanser that promotes cell turnover to help repair sluggish, dull skin. Patented QuSome technology delivers a powerful combination of antioxidants to . - Stem cell research should be legal and funded by the government in all 50 states. There are several types of stem cells that we have available to use for research. The controversy comes from the use of Embryonic Stem Cells (ESC) and .